The 2000-year-old Boppard lies at the largest loop of the Rhine, which changes its direction, turning at almost 180 degrees. This means that the Rhine flows in one direction and after a narrow turn, out again in the other direction. 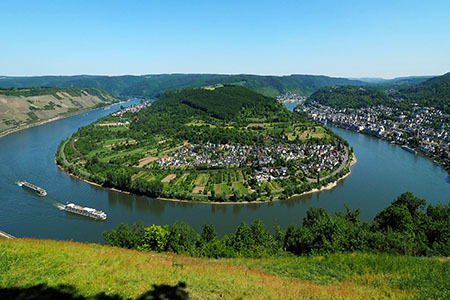 This turn is caused by the huge massif of the Boppard ridge, which, with its steep, sun-kissed slopes, constitutes one of the biggest continuous wine growing areas of the middle Rhine. The Filser Ley on the opposite side of the Rhine separates the two arms of the river. In its entirety this enchanting natural spectacle can only be enjoyed higher up. The most famous observation spot for the Rhine loop is unexpectedly called "Vierseenblick (=four lake view)" derived from two hills which limit the view in a way that lets the Rhine appear as four different lakes. To get up here, you need to climb up 200m on beautiful forest paths, or alternatively, you can take the chair lift in comfort. For the climbers, the hard work is compensated on reaching the restaurant terraces and enjoying the view over Boppard and the Rhine loop. From up here it also becomes clear why Boppard is at an advantage for wine production, lying in a valley opening of the Rhine at the foot of the Hunsrück. No less than six Hunsrück valleys end in the Rhine here. Items dating back to Stone Age found here are evidence that this was used as resting place by hunters in prehistoric times. A denser population of the valley area of Boppard is documented by the Roman street settlement "Bodobrica" or "Boudobriga" in the entrance area of the Muehl valley during the 1st century A.D. Since the Roman name is actually of Celtic origin, it is likely that a Celtic settlement existed even earlier here. Boppard's very famous late Roman fort with its 8m high protective wall and numerous towers was erected in the middle of the 4th century to establish the Roman borders. In the 5th century, an early Christian church was built on the ground walls of the fort baths. At the exact same place the late Romanesque St. Severus Church followed mid 12th century. The three-nave main building of the church dates back to 1225 and is decorated with impressive wall paintings of St. Severus. The remains of the fourth century Roman camp, the medieval towers, the powerful gates and the mighty twelfth century Romanesque double towers of the Severus church dominate this small town. Moreover, in medieval times, the electoral fortress developed with a square keep. It was erected as a stronghold by the archbishop Balduin of Luxemburg after he conquered it by military force and declared it an administrative centre of the Trier electorate. This put an end to the growth phase of the "Free imperial city" Boppard, as stated in the old town seal: "Boppard, free and special city of the Roman Empire." All subsequent attempts to regain the autonomous status of a Reichsstadt for Boppard were unsuccessful. The town remained under government of the Trier Elector until the end of the 18th century when French troops conquered the country in 1794. Some of the medieval wall structures, including the "Bingertor (=Binger Gate)", are still preserved today. Also worth a visit are the Carmelite Church, which was started around 1300, and the Benedictian monastery "Marienberg", dated 1123. An unusual attraction of Boppard is the Hunsrück train, protected under monument conservation legislation. It is the steepest standard gauge railroad in Germany, starting here and climbing up 350m on the way to Emmelshausen in the Hunsrück —a real mountain train! Five tunnels and two breathtaking viaducts in nauseating altitude make the 30-minute journey through the Boppard forest a real, memorable adventure though not suitable for the faint-hearted. If you dismount in Buchholz, you can combine the expedition with a hike through the wildly rugged Ehrbach ridge down to Brodenbach at the Mosel. Not far from Boppard are the fortresses "Liebenstein" and Sterrenberg" which result from a long family feud between two brothers about the division of their inheritance. They devoted all their energy into the dispute and built a "fight wall" between the two fortresses. Today you see a visitors" restaurant in Sterrenberg, which boasts an extensive view from the Hunsrück to the Rhine valley.